I have spent the day working on my Gandhi painting. 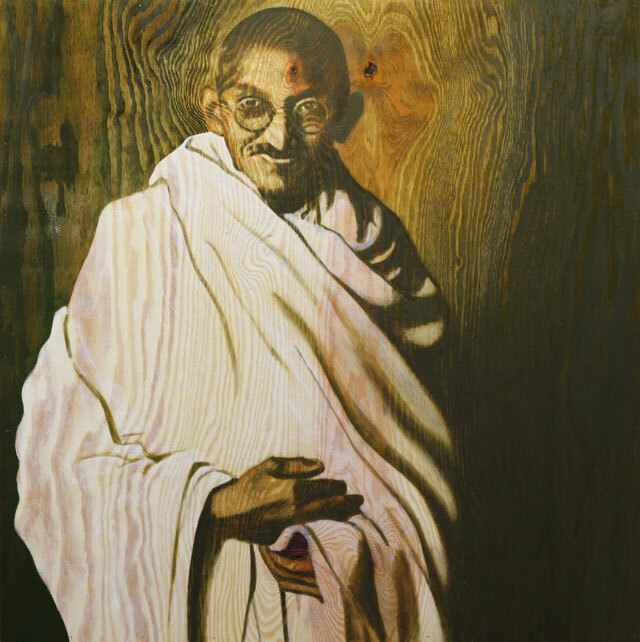 I have mixed feelings about painting famous people with an icon status such as Gandhi’s, because so many people have opinions on how they look/looked, etc. It is too easy to become preoccupied with the person instead of letting your imagination work. I doubt this painting will trigger thoughts, questions, imagination, maybe even stories in people’s minds. They will look at this painting and say “oh, look – it is Gandhi”. They will study it for a while, find something to criticize, and then turn around and forget what they saw. It has probably been a wasted day. But it was good excercise, though. I enjoyed the work.